SONiVOX has announced its new PitchMIDI real-time audio-to-MIDI synthesizer and converter software. This month, Mystery Island Music offers special sales on its Roland JP-8000 & JP-8080-related soundsets and editor. JamOrigin's MIDI Guitar 2 Beta 9 is now available to customers, with current plans for a final release in the weeks to come. 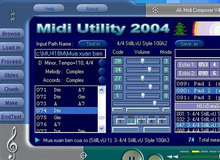 Jam Origin released beta 2 for its MIDI Guitar 2 converter software, in order to fix sensitivity and noise gate issues. IK Multimedia offers iRig Pads owners a free software editor for Mac OS X and Windows that allows for customizing the universal MIDI controller.